Next Video DARK SOULS 3 IN VR - Dark Souls 3 First Person mod with the Oculus Rift! 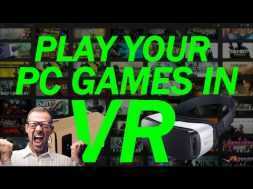 In todays video, ManVsVR is showing you how to play PC games on your Gear VR and/or mobile device ready Head Mount Unit. If you have any questions, Be sure to ask in the commments on his channel. next DARK SOULS 3 IN VR - Dark Souls 3 First Person mod with the Oculus Rift!